You do not need to take your new car back to the Dealership for servicing. They do not have a monopoly on new car “Log Book” Servicing. It is illegal for them to suggest that your rights to a warranty are void, simply because the vehicle is serviced by another qualified mechanic. 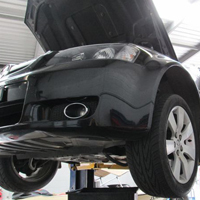 Our qualified mechanics fit only the best quality spare parts that are covered by Australia wide warranties. Your safety and peace of mind are very important to us here at Angus Car Service.